We usually answer emails within few working days since we get them. In case of absences lasting more than few days, we'll notify our costumers with a note in the page of news. If you with to withdraw your purchade by our laboratory, or in case you wish to talk to us in person about a project, etc., please contact us via email and get an appointment. 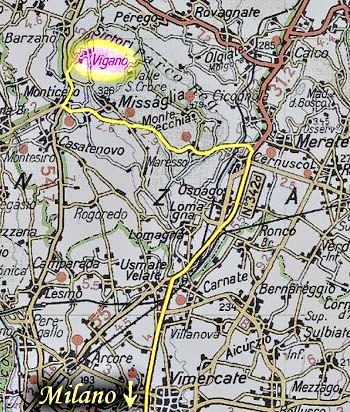 Viganò is a village in the countryside called Brianza, about halfway between Milan and Lecco. Leaving Milan, get on the highway called "Tangenziale Est" and go north, up to and over the tollgate. Follow the direction to Lecco (blue signs). When you get to Cernusco Lombardone, at a large crossroad, follow the direction to Montevecchia (at your left), passing between a sport-field and a car dealer. Drive through the village of Montevecchia, until, always keeping on the same road, you get to Monticello Brianza. At a rather large roundabout, turn right, following the direction to Lecco, and passing by a veterinary clinic, few yards after the roundabout. ABout one and a half miles later you'll be in Torrevilla, fraction of Monticello. To the right you'll see a shop named "Siel" and after that, a hardware shop: about 30 yeards further, turn right into an upgrading road, following the direction to Viganò. Get on top of the hill and get down on the other side, ignore Oberdan st. at your right, and carry on straight until you get to the secon right turn, with a big magnolia tree right on the corner (note: the sign of access denied refers to another street, about 60 yards further). Turn right at the magnolia tree, you're now in Risorgimento st., get to the small square with the pizzeria and turn right again, into Quasimodo st. The 17 is at the end of the street, but it's a good idea to park before the bottleneck. Neraluna isn't a shop, it's an artisan laboratory! Most of our products are made on commission and we rarely store our merchandise. Get an appointment is you want to visit us! If you don't contact us in advance, you may not find what you're looking for, or even... anyone! To place an order, all you have to do is to send us an email with all the needed infos. More details can be found in the pages of products. Most of our products are delivered, worldwide, by posts or courier. It's also possible to withdraw your purchase by our lab.